Viewing 1 current event matching “indieweb” by Date. Viewing 73 past events matching “indieweb” by Date. This will be held concurrently with the Homebrew Website Club meeting in San Francisco with a remote video link between the two sites! This is the last Homebrew Website Club before IndieWebCamp 2014! Come enjoy breakfast and talk about the Indie Web! Aaron Parecki is organizing breakfast for folks in town for Open Source Bridge. Come to TILT around 7:30-8, order food or coffee at the counter, and join us at one of the large tables! Those of us attending Open Source Bridge will walk to the venue for the 9:00am keynote afterwards. Join us at Esri's new R&D Center office in downtown Portland for two days of a BarCamp-style gathering of web creators building and sharing open web technologies to empower users to own their own identities & content, and advance the state of the indie web! You’ll learn about ways to empower yourself to own your data, create and publish content on your own site, and only optionally syndicate to third-party silos. Along the way you’ll get a solid grounding in the history and future of Microformats, domain ownership, IndieAuth, WebMention and more. The IndieWeb movement is a global community that is building an open set of principles and methods that empower people to take back ownership of identity and data instead of sharecropping on 3rd party websites. Homestead, don’t sharecrop! You’ll learn about ways to empower yourself to own your data, create and publish content on your own site, and only optionally syndicate to third-party silos. Along the way you’ll get a solid grounding in the history and future of Microformats, domain ownership, IndieAuth, WebMention and more! CANCELLED: Sorry, Aaron is unable to host this week! If you were planning on coming, you should update this event with a new location, just pick a nearby bar or something! Are you building your own website? Distributed social network? Federated reader or wiki? IndieWeb site? Silo scraper/syndicator? Content addressable storage system? P2P distribution system? or Just Looking for a fun personal project? Come meet with other people working on similar projects, swap ideas, and collaborate! Or just come to sit down with some headphones and hack away. Meetings and projects tend to be IndieWeb centric but anyone who is willing to sling code/writing/art to scratch their own itch and to help build tools and infrastructure that they think is needed are welcome! Lots of people are out of town this week so we are meeting at a cafe and having an informal, do what you want meeting. It will probably be mostly a hack night, which ought to be fun! Bring a laptop and a project and your latest ideas. 5:30pm - 7:30pm (or later!) - Work/Talk/Demo whatever you want! Are you building your own website? Indie reader? Personal publishing web app? Or some other digital magic-cloud proxy? If so, come on by and join a gathering of people with likeminded interests. Bring your friends that want to start a personal web site. Exchange information, swap ideas, talk shop, help work on a project, whatever! This week's Portland meetup is part of PDX DevWeek, so we will be running it as more of an unstructured hack night rather than the traditional format. Are you building your own website? Indie reader? Personal publishing web app? Or some other digital magic-cloud proxy? If so, come on by and join a gathering of people with likeminded interests. Bring your friends that want to start a personal web site. Exchange information, swap ideas, talk shop, or help work on a project! IPFS Just launched and it would be great to talk about how it can help people host large files on their personal sites. 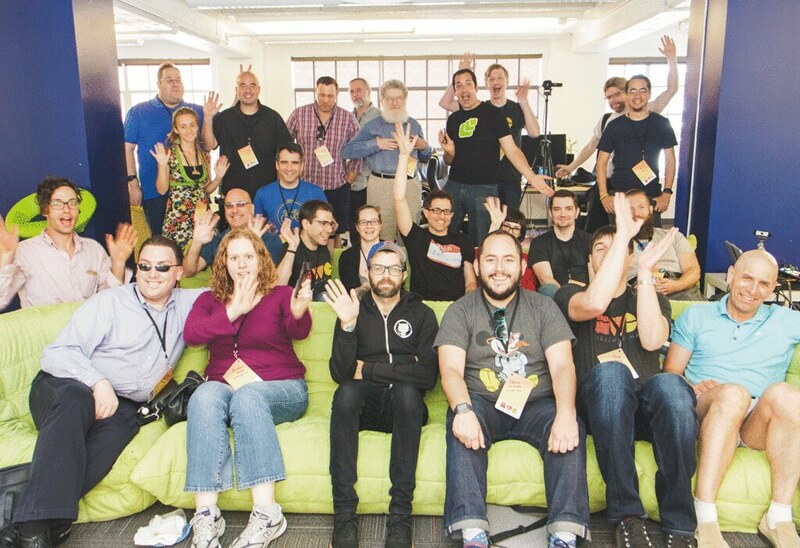 Join us at Esri's R&D Center office in downtown Portland for two days of a BarCamp-style gathering of web creators building and sharing open web technologies to empower users to own their own identities & content, and advance the state of the indie web! Co-working night! Are you building your own website? Indie reader? Personal publishing web app? Or some other digital magic-cloud proxy? If so, come on by and join a gathering of people with likeminded interests. Bring your friends that want to start a personal web site. Exchange information, swap ideas, talk shop, or help work on a project! Come hear about the latest in the IndieWeb world! See demos from the latest IndieWebCamp in Germany, learn about the progress on Webmention and Micropub, and chat about all things IndieWeb! Bring a laptop and make some progress on your personal website too! This is a pre-party for IndieWeb Summit 2016! Everyone is welcome to the pre-party regardless of whether you're coming to IndieWeb Summit, and drink tickets will be provided for registered attendees thanks to our sponsors!. You’ll learn about ways to empower yourself to own your data, create and publish content on your own site, and only optionally syndicate to third-party silos. Along the way you’ll get a solid grounding in the history and future of Microformats, domain ownership, IndieAuth, Webmention, Micropub and more! Are you building your own website? Your own personal bot? RSS/Twitter/IRC/Slack reader? Personal publishing web app? Or some other digital magic-cloud proxy? If so, come on by and join a gathering of people with likeminded interests. Bring your friends that want to start a personal web site. Exchange information, swap ideas, talk shop, or help work on a project! It's more important than ever to have your own place to publish on the web. Have a blog? Want a blog? Are you building your own personal bot? Come on by and join a gathering of people with likeminded interests. Bring your friends that want to start a personal web site. Exchange information, swap ideas, talk shop, or help work on a project! Special thanks to DreamHost for providing pizza and beverages for the event! Special guest: This week, Manton Reece from micro.blog will be in town! Join us for the pre-party for IndieWeb Summit 2017! Everyone is welcome to the pre-party regardless of whether you're coming to IndieWeb Summit, and drink tickets will be provided for registered attendees thanks to our sponsors! Thanks to DreamHost for providing pizza and beverages! Have you been looking for an excuse to spend some time on your personal website? Come on by and join a gathering of people doing the same! Join the IndieWeb and Micro.blog communities for an evening of demos and discussions! Thanks to Okta for sponsoring the first round of drinks! Join us for the pre-party for IndieWeb Summit 2018! Everyone is welcome to the pre-party regardless of whether you're coming to IndieWeb Summit, and drink tickets will be provided for registered attendees thanks to our sponsors!